Click here for audio of Episode 1949. Today, America's Charles Darwin. The University of Houston's college of engineering presents this series about the machines that make our civilization run, and the people whose ingenuity created them. James Dwight Dana was born in Utica, New York, in 1813. He studied natural history in general, and geology in particular, at Yale. After graduation he spent a year teaching midshipmen on a Navy ship. That adventure led to his first scientific paper -- a study of the Mt. Vesuvius volcano, which he visited on the trip. He returned to two-years as a teaching assistant at Yale. Then he was invited to join America's first great voyage of discovery, the Wilkes Expedition. In that, Dana parallels Darwin. Like Darwin, he'd been only a so-so student, now singled out for a great life-forming adventure. Seven years before, Darwin had served 3-1/2 years as naturalist on the British ship Beagle; now Dana served four years in that role on an American ship. Neither could have received a better education. And neither would have, without his own acute perception. Both saw many things. Darwin was most taken by the species he'd seen in the Galapagos Islands -- Dana, by the coral reefs of the Pacific Ocean. Back in America, Dana, like Darwin, spent years writing up his findings. Then, at 43, Dana was made a professor at Yale, where he stayed until shortly before his death at 82. 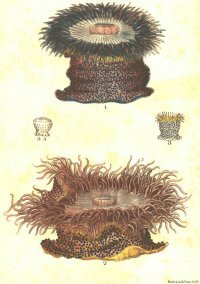 Dana and Darwin both wrote about the forms of reefs, and they independently described the important role of subsidence in shaping them. Darwin said that Dana's writings were "wonderfully satisfactory," and they caused him to be astonished at his own accuracy. But reefs were only one element in a much larger tapestry. Dana also wrote the dominant American college textbooks on geology and mineralogy. Those books were used well into the next century. The evolution of the system of life went forward through derivation of species from species, according to natural methods not yet clearly understood, and with few occasions for supernatural intervention. -- this, in a world going to war over how it came into being. Dana continued to argue for minimal divine intervention, but he did accept evolution by natural selection. Meanwhile, when he was not adding to his huge output of scientific writing, he wrote both hymns and love songs for the guitar. My first grounding in science came from Dana, 43 years after he died. My father took a University class in geology. He'd come home and tell me the exciting things he was learning. Then, in our workshop, we'd use Bunsen burners and blowpipes to redo Dana's mineralogy experiments. That was magical stuff for an eight-year-old. W. Stanton, Dana, James Dwight. Dictionary of Scientific Biography (C.C. Gilespie, ed.) New York: Charles Scribner's Sons, 1970-1980. 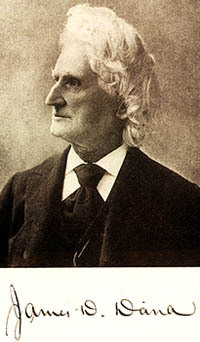 W. N. Rice, James Dwight Dana, Geologist 1813-1895. Leading American Men of Science, New York: Henry Holt and Company, 1910, pp. 233-268. J. D. Dana, Corals and Coral Islands. New York: Dodd & Mead, Pubs., 1872. J. D. Dana, Manual of Geology. Philadelphia: Theodore Bliss & Co., 1863. J. D. Dana, New Text-Book of Geology. 4th ed. New York: American Book Co., 1874. 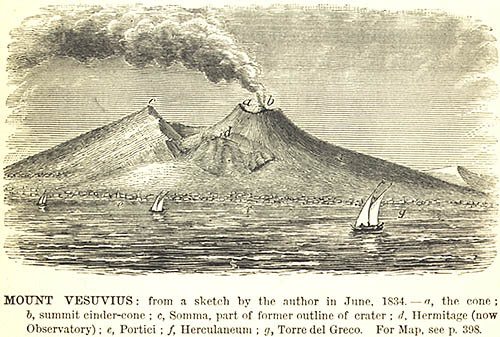 Dana's sketch of Vesuvius from his 1863 New Text Book of Geology. Dana describes the subisdence of reefs in his 1863 Manual of Geology.